Evian-les-Bains is a lovely town on the edge of Lake Leman in the French Alps, north-east of Geneva and with Switzerland on the opposite shore of the lake.. A few years ago Evian won the award for the best resort in France in the World Travel Awards and is also, of course, famous for its spring water which is sold worldwide. 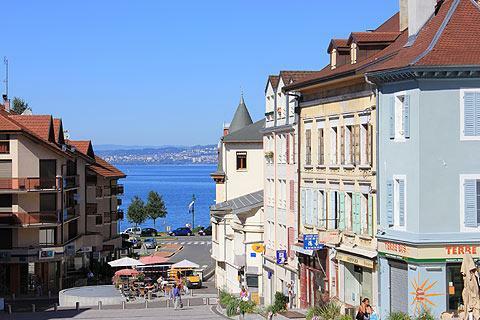 France This Way comment: below we mention some of the most important highlights to see in Evian, but it is the town as a whole and its lakeside setting that creates the lasting impression on you rather than any particular monument. 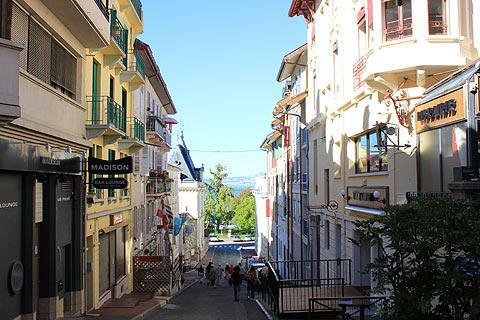 Your first stop should be at Evian-les-Bains tourist office which can give you a useful map with a walking route of the town which takes in the key buildings. 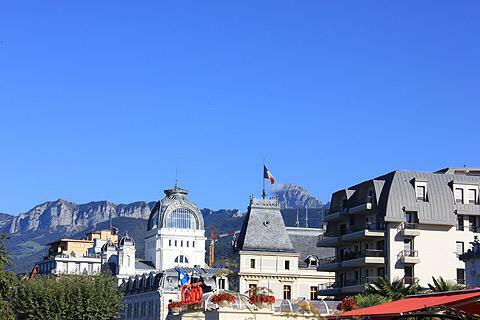 The walk along the lakeside is particularly nice with the lake and views across to Switzerland on one side and some fabulous buildings including the Palais Lumiere, the Casino and the Theatre on the other. 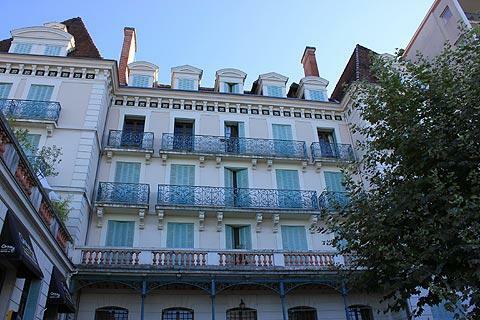 You can almost imagine the gentry of the early 19th century promenading up and down along Evian's quays. The Palais Lumiere is a lovely building with views out to the lake that was built by a Parisian architect at the begining of the 19th century. Its facade is a lovely yellow and white and on its roof is a wonderful square tower and glass dome. Walk up the stairs and in the large entrance lobby you can see paintings of nymphs. The palace is also used as an art gallery. Inside, the large hall is a beautiful airy space with coloured light entering through the large stained glass windows. This area was the pump room and water flowed into the red marble basins beneath each of the four statues in the room. Take a look at the floor which is a beautiful wooden polished floor laid out in a star pattern. Upstairs were treatment rooms but these are now function rooms. 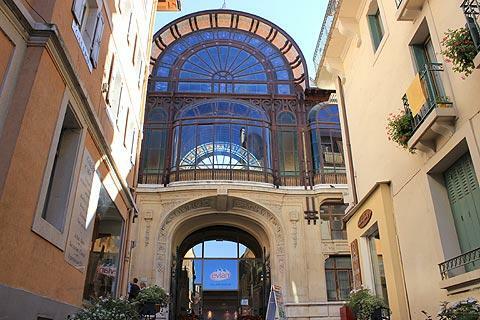 Evian's theatre was built in the late 19th century and has a neo-classical facade. Inside it still has its original polychrome and gilded decoration and is still open as a theatre. The Casino dominates the water-front promenade in Evian-les-Bains. 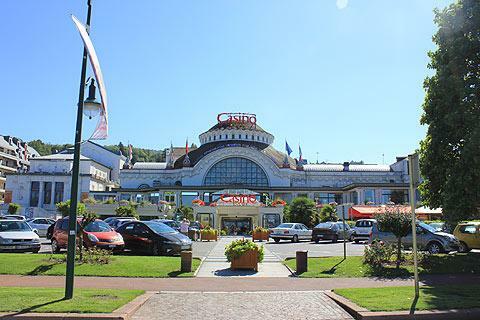 Any spa town worth its salt had a Casino in the early 1900s and Evian was no exception. 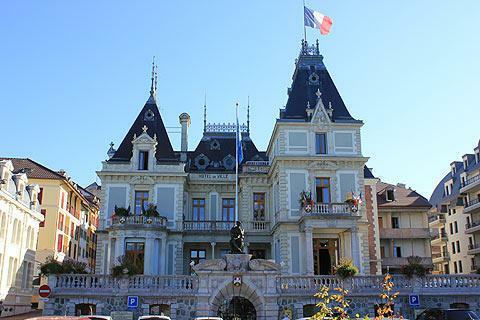 In 1877 Evian was bequeathed a 17th century castle which was turned into a Casino. In 1911 this was destroyed and the new casino built. It is dominated by its cupola which was inspired by the Neo-Byzantine style. The Villa Lumiere has been the Town Hall for Evian since 1927. It too is built in neo-classical style. It belonged to Antoine Lumiere whose sons Louis and Auguste who invented the cinematograph: their work is celebrated in the Museum of Lumiere at Lyon. Inside the Villa Lumiere, the hall and the gilded drawing room (now the wedding room) are open to the public during office hours. 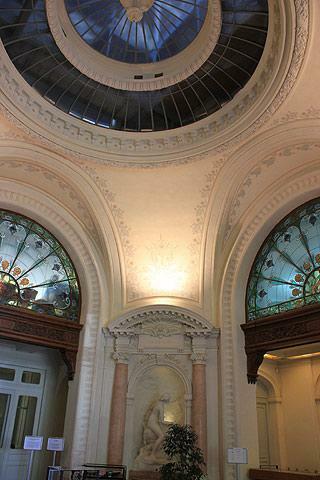 The Cachat pump room is a fabulous building and has a wonderful entrance with a cupola of glazed tiles and a huge semi-circular glass window. This was the centre of spa-based social life and contains a reading room and a lounge with the water fountain at the centre. 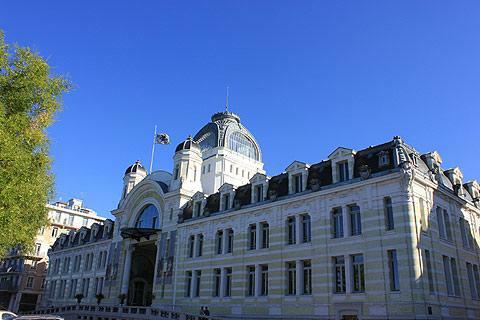 This building is the best Art Nouveau building in Evian and is considered one of the best examples of spa resort architecture in France. The Cachat spring is the most famous of the numerous springs in Evian and is opposite the Cachat pump room. Its fame began when it cured a mysterious illness suffered by the Baron of La Rochette, and the waters of Evian are now famous throughout the world. Behind the lake front area is the main town where you can explore lots of attractive medieval streets, often opening up to give a view over the lake. The market square was the centre of commerce when the lake was a commercial harbour. Don't miss the musical fountain on Quai Paul Leger next to the marina. A spectacle of water and music that takes about half an hour, the musical fountain is free and operates between May and October. Evian still has a working funicular railway, originally built to take guests between the Cachat spring and the Splendide and Royal hotels. It is now open in the summer season for tourists. 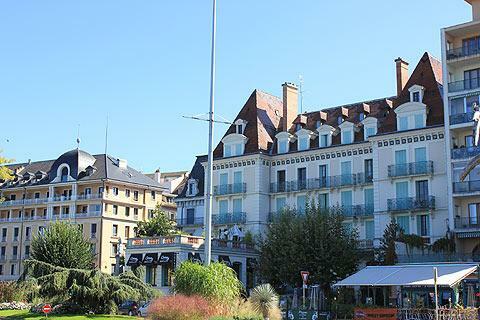 Of course Evian is also still popular for its spa treatments and Les Thermes d'Evian occupy a lovely position opposite the lake. - If you are interested in the bottling process of Evian you can visit Evian's bottling plant at their factory between Thonon and Evian. - There is a water garden on the edge of Lac Leman at Evina. The Jardins de L'eau du pré curieux are set in 3.5 hectares and show various water-based ecosystems. 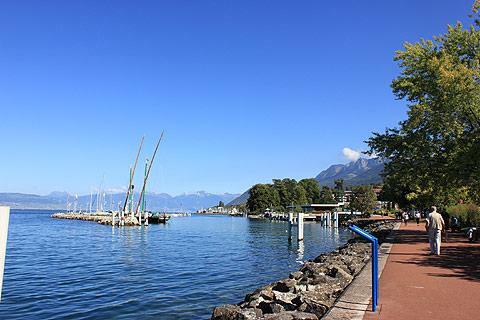 Access is by boat from the Quai Baron de Blonay (the main quay in Evian). - Boats also leave Evian to take you on a 35 minute boat trip across the lake to the Swiss 'riviera' town of Lausanne. From here you can also take boat trips all along the Swiss lake edge and visit the beautiful towns of Montreux and Vevey and Chillon. - Ripaille castle is 8km from Evian and as well as visiting the 15th century castle and its arboretum you can sample and buy wine from the estate. 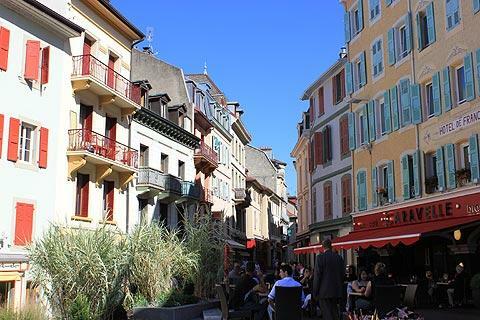 - There are several picturesque villages along the lake near Evian, with Yvoire to the west being one of our favourite villages in France.